In just a few years, our movement to stop plastic pollution has grown by leaps and bounds, from Los Angeles to Marin, with single-use plastic bags now banned in more than 100 communities. Together, we can achieve a statewide ban — saving more sea turtles and other wildlife by keeping plastic out of the Pacific. Californians throw away 123,000 tons of plastic bags each year, and too many of them end up as litter in our ocean. Today, there are 100 million tons of trash in the North Pacific Gyre; in some parts of the Pacific, plastic outweighs plankton 6 to 1. 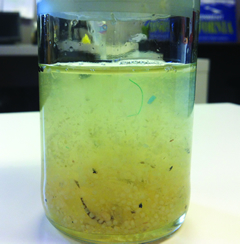 Turtles and seabirds frequently ingest floating plastic, mistaking it for food. They also get entangled in bags and often drown or die of suffocation. Adult seabirds inadvertently feed small bits of plastic to their chicks — often causing them to starve to death after their stomachs become filled with plastic. Toxic pollutants leach from the plastic into the water. Scientists are now studying whether fish and other marine animals absorb these toxic pollutants. If so, there is a good chance that we also absorb them when we eat fish. What’s really scary is that scientists tell us this plastic may never biodegrade. And every day we go without tackling this problem, it becomes a little bit worse. Nothing we use for a few minutes should pollute our oceans for hundreds of years. Californians know this, and are taking action to protect the Pacific. We’ve made great progress winning local bans and educating the public on the harmful effects of plastic. Today, bags are banned (or soon will be) in more than 100 California communities — and now 1 in 3 Californians are living bag-free. It's a great start, but we’re not stopping until we rid the whole state of plastic bag pollution. Let's ban the bags statewide! With more cities banning bags each month, we have the momentum. 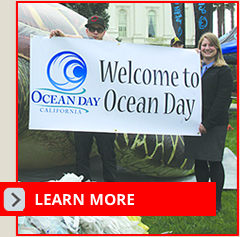 With your help, we can win an historic victory for our ocean — a statewide ban on plastic bags. Member support makes it possible for our staff to do research, make our case to the media, reach out to critical constituencies, and help government officials make the right choices for our ocean. New Ballot Measure Threatens California’s Coast and Ocean. Sacramento, CA- The California Secretary of State has just certified a ballot measure to repeal the California ban on single use plastic bags (SB 270). Out-of-state single use plastic bag companies paid over $3 million dollars 98% from out of state to repeal the popular law. Sacramento – Governor Brown has signed a statewide plastic bag ban into law. The bill, SB 270, will phase out such bags in grocery stores and pharmacies beginning July 2015, and in convenience stores one year later. Environmentalists overwhelmingly supported the measure authored by senators Alex Padilla, Kevin de León, and Ricardo Lara. Sacramento – Governor Brown said that he would "probably" will sign a statewide plastic bag ban into law. The bill, SB 270, will phase out such bags in grocery stores and pharmacies beginning July 2015, and in convenience stores one year later. Senators Alex Padilla, Kevin de León, and Ricardo Lara authored the measure, which passed out of the California State Legislature last week. Sacramento – The California Senate voted 22-15 to pass a statewide ban on single-use plastic bags. The bill, SB 270, will phase out such bags in grocery stores and pharmacies beginning July 2015, and in convenience stores one year later. Senators Alex Padilla, Kevin de León, and Ricardo Lara authored the measure, which now heads to the Governor’s desk. Bags are banned in more than 108 California communities, from Fairfax to Calabasas, San Jose to Monterey, Los Angeles to San Francisco. Millions of tons of plastic and other garbage are swirling in our oceans. Plastic debris kills hundreds of thousands of sea turtles, sea birds and marine mammals each year. A statewide ban could keep 123,000 tons of plastic bags out of the waste stream each year. Want to pass a bag ban in your town? Download our Activist's Toolkit to get started.